WESTBROOK — Rock Row will be alive with music beginning next spring, with a few conditions. The Westbrook Planning Board gave the go-ahead Tuesday for Waterstone Properties Group, the owner of the former quarry site at 58 and 80 Main St., where it has proposed a mixed-use project, to team up with Waterfront Concerts and Live Nation to construct a temporary 8,200-seat amphitheater on the site. The board approved the scheduling of up to 16 concerts, dance performances or other cultural events between late May and late September 2019, but only two shows will be allowed in a seven-day period at the site on the Westbrook-Portland line. The Planning Board also said events must be over by 10 p.m. Sunday through Thursday and by 11 p.m. Friday and Saturday and on Sundays when Monday is a holiday. Jon Dow, a promoter with Waterfront Concerts, said during the public hearing on the concert venue that the restrictions would work for 2019, but to make the effort viable “we really need to be able to scale it up” to 30 shows a year and up to three shows a week. Board members in deliberations following the public hearing did not alter their restrictions. Westbrook Police Chief Janine Roberts and Fire Chief Andy Turcotte said they would be comfortable with providing public safety services for 16 shows. More shows than that would mean mutual aid from surrounding police departments would need to be brought in, Roberts said. Finding a regional approach, she said, is something she will bring up at a meeting with area police chiefs next month. “I expect it can happen and we will figure it out,” she said. Another condition of the venue’s approval was that noise limits in neighborhoods cannot exceed 55 decibels or 5 decibels “above ambient, whichever is greater.” The applicant had asked for that to be increased to 10 decibels over ambient. According to the Center for Hearing and Communication, 55 decibels is equivalent to the level of noise generated by a coffee percolator or dishwasher. A $1,000 noise penalty would be imposed if the city receives three or more noise complaints during an event and the applicant fails to address the issue. Not meeting curfew would bring with it a $5,000 penalty. If noise penalties or curfew penalties occur at three events over the course of the season, the Planning Board could impose additional standards. The board also asked the applicant to hire a event compliance director to make sure concerts and events uphold the standards and address any issues raised. City Planner Jennie Franceshi said the director would be asked to provide a yearly concert management report to the city. On-site parking for the venue would accommodate up to 1,721 vehicles. Both the parking and amphitheater would be temporary as Waterstone Properties Group and Waterfront Concerts determine if the amphitheater concept works. If it does, the venue would be moved to a permanent location on the property. The temporary site would then be used for a permanent parking structure, as well as the second phase of Rock Row’s master plan, which includes a food/beer hall, movie theater, restaurants and office space. Former City Councilor John O’Hara has long hoped for a concert venue in Westbrook. “It’s something we have coveted for many years. I strongly urge you to support it,” he told the Planning Board Tuesday. Dave Gutter, a musician from Gorham, said bringing a venue like this to Westbrook is long overdue. “I think it would be great for the local music scene and economy,” he said. Not everybody at the meeting was happy with the idea of the amphitheater. Susan Sheloske of Robyn Avenue said she concerned about the noise level, a concern shared by Berkeley Street resident Kelly Milewski and Brenda Kielty, who lives on Devon Street in Portland. Sheloske is also concerned the venue does not have enough parking and is incompatible with other proposed uses on the property. “I can’t stand here with a straight face and say we won’t be seen or heard,” Dow said. But he and others involved in the project are committed to making the impact on neighbors as manageable as possible, he said. The Westbrook site is a half-mile from the nearest resident, he said, while the closest neighbor to the Maine State Pier in Portland and Waterfront Pavilion in Bangor is 800 feet. Waterstone has brought on Eric Reuter, a sound engineer with Reuter Associates in Portsmouth, New Hampshire, to set up sound monitoring stations on Forest Street, Colonial Road, the Deer Hill neighborhood in Westbrook and the Nasons Corner neighborhood in Portland. Reuter will also monitor noise at the site from May to September. The data will be collected 24 hours a day and be publicly available. He will issue a report after the first three events and at the end of every concert season. 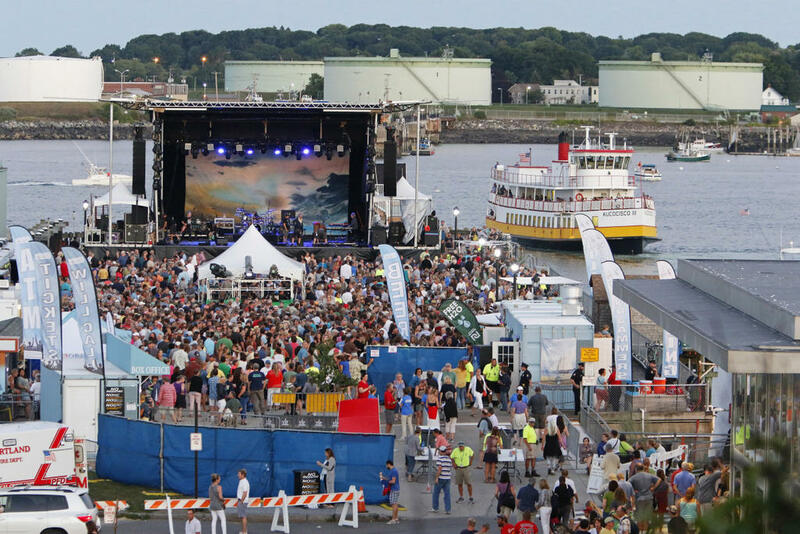 With the approval from the Westbrook Planning Board now in hand, Waterfront Concerts will move ahead with a plan to move its summer concert series from the Maine State Pier in Portland to a former quarry site in Westbrook.